EXMO, a UK based Bitcoin Exchange was launched in the year 2013 by EXMO Finance LLP. It is one of the largest cryptocurrency exchanges in Europe with an average monthly trading volume of 1.5 Billion USD. Even though EXMO exchange offers lower liquidity than exchanges like BitMEX, it is a good choice for inexperienced traders to start their cryptocurrency trading/investment. The exchange is owned by EXMO Finance LLP which is a registered company and complies with the laws of England and Wales. Even though the exchange offers an online wallet to store the coins of its customers, it doesn’t provide any insurance like Coinbase does. The trading interface of EXMO exchange is so simple that even a novice trader can easily buy cryptocurrencies immediately after creating the account. This EXMO review will analyse several aspects to provide you with an all rounded detailed overview of the exchange and its services. Although Cryptimi does its best to provide you accurate info and to update it on regular basis, we strongly recommend that you to visit exmo.com for any updates which might occur after the time of writing. EXMO exchange is considered a safe platform to buy/trade cryptocurrencies. Even though there was a DDoS attack in 2017, no coins have been stolen. Like all other exchanges, EXMO also provides 2FA (Two-factor authentication) to prevent unauthorized access. It also allows the users to add the list of trusted IP addresses to their account for better protection. And, the system will notify the user immediately if the login is made using any other devices. The exchange is not a broker as it doesn’t store Bitcoins or other altcoins. It is a cryptocurrency trading platform which allows the users to buy/sell the most popular digital currencies. After creating the account, the users can buy cryptos either using fiat payment methods like Credit card, Wire transfer, SEPA etc or by depositing Bitcoins or other altcoins. EXMO exchange does offer a web-based wallet to store your coins. But, web-based or online wallets are always associated with risk factors like private key hacking. Because the exchange doesn’t offer insurance, the users will lose all their funds, if the exchange security is compromised. Hence, it is highly recommended to use hardware wallets like Ledger Nano S, Trezor etc for better security. Alternatively, the users can also store the coins on the most secure exchange online wallet, on Coinbase. Any individual can create an account on EXMO and start trading immediately. (Applicable only for crypto payments). The fees for different payment methods and cryptocurrencies are listed clearly on the website. EXMO exchange allows the users to reset/recover the password. If the user loses his password, he can reset it by following the instructions sent to his email address. Navigate here and click ‘Sign up’ button on the top right of the page. 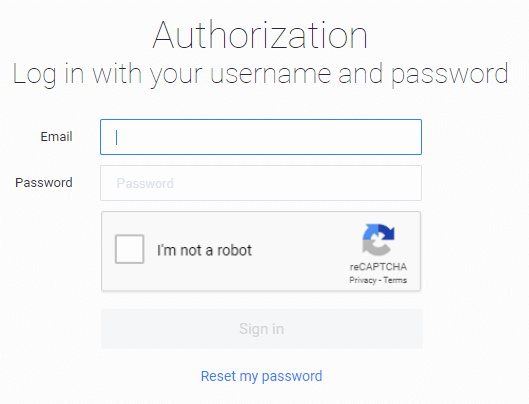 Enter the username, email address, password and click ‘Register’ button after completing the captcha and agreeing to the terms. Within a few minutes, you should receive a confirmation email from the EXMO team. Click the link on that email to activate your account. Congratulations! You have successfully created your account on the EXMO exchange. Navigate their site and click ‘Sign In’ button on the top right of the page. 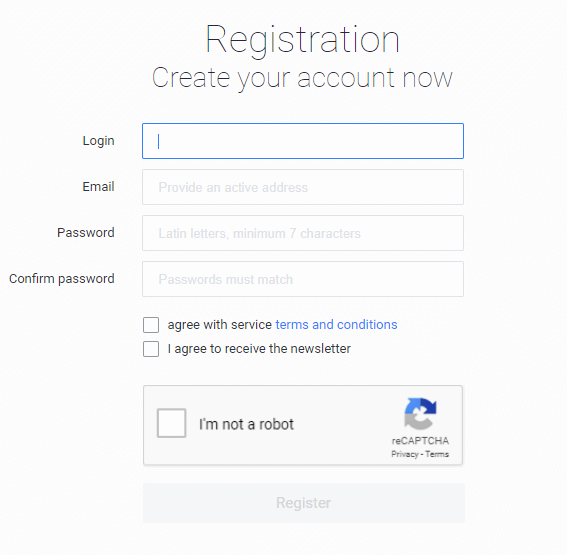 Enter the email address, password and click ‘Sign In’ button after completing the captcha. To deposit/exchange cryptocurrencies, users don’t have to submit any kind of documents. However, users must verify their identity by submitting relevant documents in order to buy cryptos using fiat currencies. They should upload two documents: Identity (passport, driving license or other government-issued ID) and Address (Bank statement, Utility bills, or other kinds of certificates issued by the government to verify the residency). Apart from the above documents, the users should also download the Agreement from the EXMO website, put their signature on all the pages and upload that signed agreement in order to complete the verification process. In the EXMO exchange, users can deposit 6 different fiat currencies and 20+ cryptocurrencies. Follow the steps below to deposit funds on EXMO. Login to your EXMO account. Click the ‘Finance’ link located on the top of the page. Select the fiat currency and click the corresponding ‘Deposit’ button. In this example, EUR is chosen. 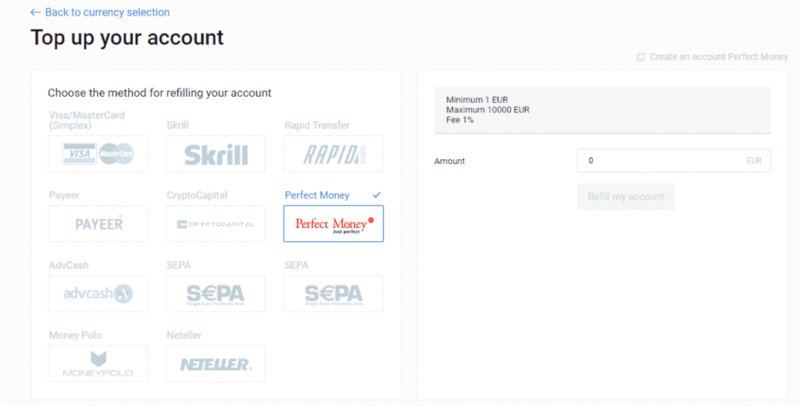 Now, you will see all the payment methods for EUR on your screen. Select the desired payment method, click the link ‘Please pass the verification’ and follow the on-screen instructions to verify the payment method. Only then, you can deposit fiat currencies on EXMO. You can follow the above procedure to deposit any of the 6 fiat currencies using different payment methods. Select the digital currency and click the corresponding ‘Deposit’ button. In this example, BTC is chosen. Click the button ‘Create Address’. Now, you will be shown the wallet address to which you have to send your Bitcoins. Either you can copy the address or use the QR code on your personal wallet to send the BTC. Your Bitcoins will be deposited immediately after 1 network confirmation. Likewise, you can deposit any cryptocurrency you like by following the above procedure. EXMO exchange offers two modes: Trading and Exchange. The trading mode is intended for experienced traders whereas the Exchange mode is ideal for the novice traders who are buying cryptocurrencies for the first time. 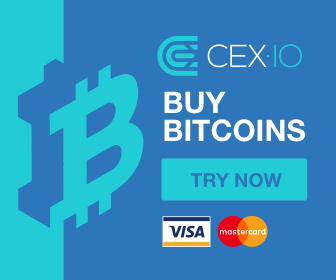 This example shows how to buy Bitcoin (BTC) using a VISA card and the fiat currency used is EUR. Before starting to buy, you should ensure that you have verified your payment method and deposited the required funds on to your account. In this example, the Exchange mode is selected. Login to your EXMO account and click ‘Exchange’ link located on the top left of the page. 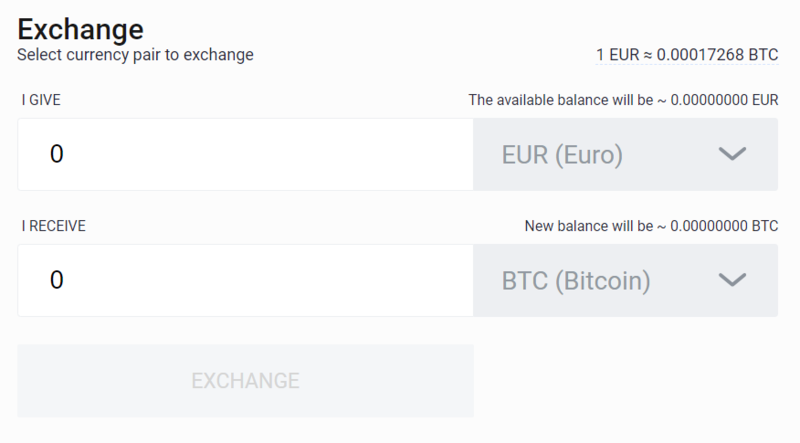 Select ‘EUR’ from the first drop-down box and enter the desired amount for which you would like to buy BTC. Then, it will show the number of Bitcoins you will receive. This example will show you how to buy Ethereum (ETH) using a VISA card and the fiat currency used is EUR. Before starting to buy, you should ensure that you have verified your payment method and deposited the required funds on to your account. In this example, the Trading mode is selected. Login to your EXMO account and click ‘Buy/Sell’ link located on the top left of the page. Click the ‘EUR’ on the top right of the page. Then, click the trading pair ETH/EUR. 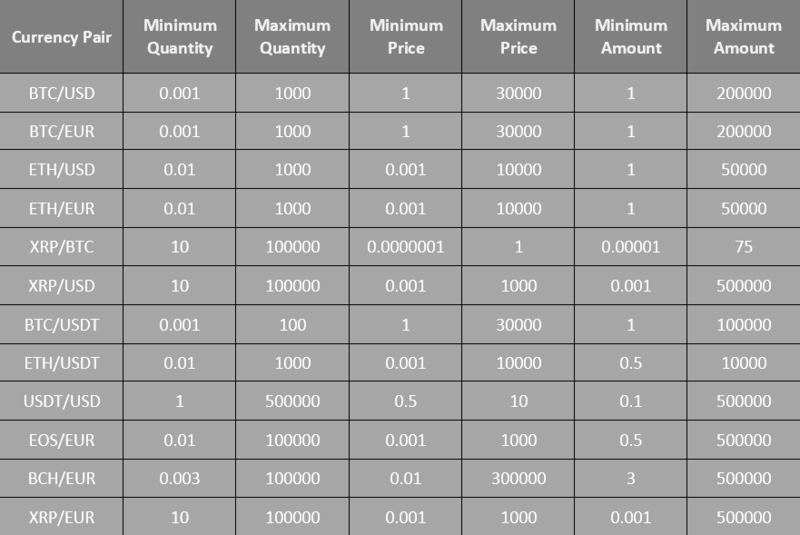 Below the trading graph, you will find two types of order: Limit order and Instant order. In this example, the Instant order is selected. Enter either the amount of EUR you would like to spend or simply enter the number of ETH you would like to buy and click ‘Buy ETH’ button. Congratulations! You have placed your first order for Ethereum. You should receive them on your wallet within 5-30 minutes once the transaction gets completed. This example shows how to buy Litecoin (LTC) using BTC. It is assumed that the user has already deposited the Bitcoins on their account. If not, kindly follow the guide above. Follow Step 1 on the section how to buy Ethereum. Click the ‘LTC’ on the top right of the page. Then, click the trading pair LTC/BTC. Follow Step 3 on the section how to buy Ethereum. 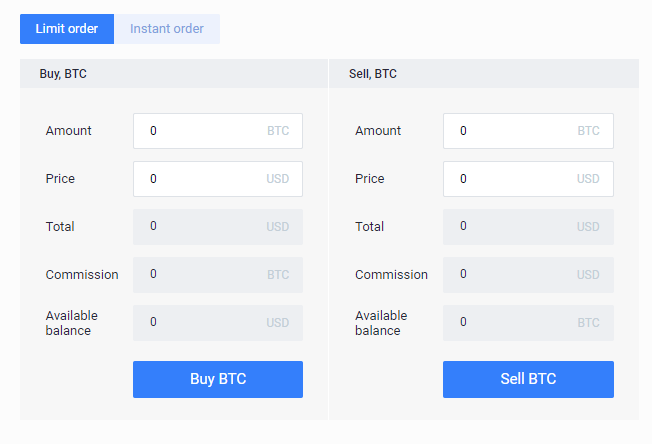 Enter the amount of BTC you would like to exchange and click the ‘Buy LTC’ button. Congratulations! You have placed your first order for Litecoins. You should receive them on your wallet within 5-30 minutes once the transaction gets completed. This example shows how to buy Bitcoin Cash (BCH) using BTC. It is assumed that the user has already deposited Bitcoins in their account. Click the ‘BTC’ on the top right of the page. Then, click the trading pair BCH/BTC. Enter the amount of BTC you would like to exchange and click the ‘Buy BCH’ button. Congratulations! You have placed your first order for Bitcoin Cash. You should receive them on your wallet within 5-30 minutes once the transaction gets completed. EXMO exchange supports withdrawal via fiat currency and cryptocurrency. Follow the below steps to withdraw your funds via fiat payment methods. Before placing your withdrawal request, you must ensure that the payment method is already verified. Login to your EXMO account and click ‘Finance’ link located on the top of the page. Select the fiat currency for withdrawal and click the corresponding ‘Withdraw’ button. Choose the payment method for withdrawal and follow the on-screen instructions to place your withdrawal request. Depending on the payment methods, your funds will be credited to your account within a few hours or days. For the fees applied, kindly visit the ‘Withdrawal Fees’ section of this review. Follow the guide below to transfer your funds to another crypto wallet. Before placing your withdrawal request, you must create a wallet account on exchanges like Coinbase or set up a cold storage wallet like Ledger Nano S or Trezor. Select the cryptocurrency to withdraw and click the corresponding ‘Withdraw’ button. Enter the withdrawal amount, a valid wallet address and click the ‘Withdraw’ button. You will receive the coins in your wallet instantly or within a few minutes to an hour. 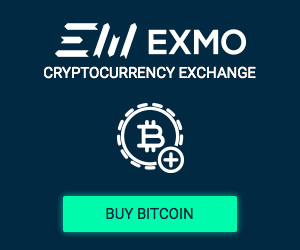 EXMO exchange allows users to buy a large number of altcoins and cryptocurrency tokens. It offers trading pairs in 6 fiat currencies (EUR, USD, RUB, PLN, TRY, UAH) and cryptocurrencies as well. EXMO exchange accepts users from more than 170 countries all over the world. EXMO accepts members from a lot of countries including EU, UK, US, Australia, and Canada. On its official website, no information is given about the list of countries where EXMO is not available. Every cryptocurrency exchange will have its own fee structure and limits, and EXMO is no exception. The fee structure on EXMO exchange is listed clearly on its website and it doesn’t have any hidden fees. EXMO Exchange charges a flat fee of 0.2% for every trade. As of 1st March 2019, EXMO announced that rates will triple to 0.6% if you conduct 3 or more EX-CODE creation in the Fiat currencies USD, EUR, PLN, TRY, UAH & RUB. The EX-CODE is an internal currency used by the EXMO exchange which allows instant funds transfer and the ability to transfer every Fiat and Crypto asset. Note that the EX-CODE commission is only for the generation of Fiat currency, and other cryptocurrency EX-CODE generation will remain free. The deposit/withdrawal fees vary based on the payment method. Given below is the USD and EUR fee schedule different payment methods. For crypto payments, the fee varies depending on the cryptocurrency. For example, there is no fee to deposit BTC whereas the withdrawal fee is 0.0005 BTC. Depending on the currency pair, EXMO has set minimum and maximum limits for quantity, price and amounts for which the user can buy cryptocurrencies. To know the limits for other trading pairs, simply go to the home page and scroll to the bottom (as shown in the previous section). Some of the payment methods will work only for a particular fiat currency. For example, Qiwi and Yandex money are available only for the RUB. Hence, it is recommended to check out the Fees section in this review or visit the official website of EXMO. Even though EXMO doesn’t provide advanced security features, it offers basic features like 2FA. Users can protect their account by setting 2FA via Google Authenticator (most popular option) or SMS. In addition to that, users can add the list of trusted IP addresses using which they will be logging on to the EXMO account. Then once you create your ticket, your query will be seen to by one of EXMO’s support agents. Alternatively, you can also send an email directly to support@exmo.com. There is an Online Chat option available on the website. However, it is mostly used to only discuss the issues among the users and not with the support team of EXMO. For general inquiries, users may refer the articles on the Knowledge Base section here. EXMO is developing both a desktop and a mobile application for its trading platform. To know the latest updates about EXMO, check out their News Section, by scrolling down their main home page. The good thing is that EXMO supports a wide range of payment methods and accepts more than 5 fiat currencies. Like most of the cryptocurrency exchanges, EXMO also offers basic security features like 2FA and IP pinning. 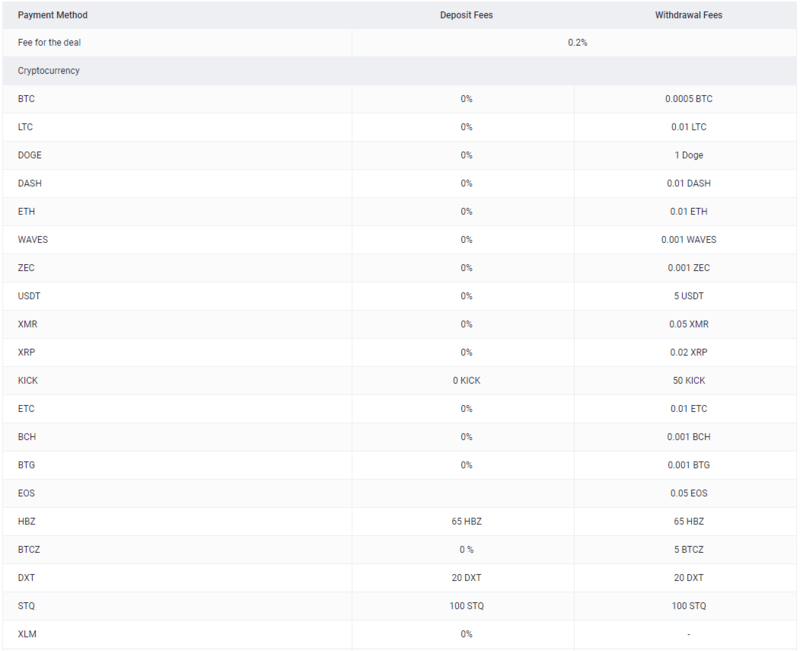 Regarding the fees, it charges high fees for some of the fiat payment methods like Payeer and Skrill. Since it doesn’t support advanced trading features like margin trading, EXMO exchange is best suited for novice traders than serious traders, however one can’t deny the nice interface.